Torino have been busy on deadline day as Salvatore Masiello finally completed his move, but there were also departures as three players left the club. For much of the day, there had been speculation about Rolando Bianchi joining Catania, however it is another Torino striker, Giulio Ebagua who has moved to the Sicilian club on loan. Ebagua has struggled to hold down a starting place for Toro since joining from Varese in the summer, and only scored three goals in twenty appearances. Biagio Pagano has also left the club to join Serie B side Nocerina on loan, whilst young midfielder Umberto Miello has been loaned to Casale. Torino will attempt to return to the top of the Serie B table tonight when they face mid-table Vicenza at home on Tuesday evening. After successive draws against Cittadella and Varese, Torino have fallen to third place and will be eager to get back to winning ways, especially as the two teams above them - Sassuolo and Pescara face difficult away games. New loan signing Cristian Pasquato is in the squad for the game, but as he only joined the club on Sunday, he is not expected to play any part in the match. Danilo D'Ambrosio is expected to replace Matteo Darmian at right back, whilst Migjen Basha could return to the starting eleven in midfield. As it is the final day of the January transfer window, there has been specualation regarding two of Torino's strikers, Rolando Bianchi and Giulio Ebagua. Whilst neither player has been in scintillating form this season, it would be a blow if either player left the club, with Bianchi being linked with a move to Catania, and Ebagua being targeted by Brescia. Vicenza are currently ensconced in mid-table in 14th position, but come into the game in poor form without a victory in their last five matches, although that run does include three draws. Former Torino striker Elvis Abbruscato is the marquee name in the Vicenza squad, and he has impressed this season scoring 13 times. Torino have made their third signing of the January transfer window by completing the signing of winger Cristian Pasquato on loan from Juventus. This move is certainly a controversial one with many Torino fans unhappy that the club has had to resort to borrowing a player from local rivals Juventus. Earlier this season, Pasquato was on loan to Serie A side Lecce but that move was cut short after he failed to maintain a regular place in the side. In the 2010/11 season whilst on loan at Modena, Pasquato scored nine goals including a number of spectacular free kicks, and his arrival may enable Toro to be more productive with their set pieces. Whilst it is obviously not ideal that Toro have had to loan a player from Juventus, if he helps Toro to gain promotion then the end will justify the means. 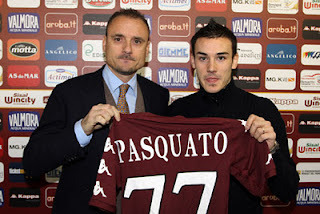 It will certainly be interesting to see what Pasquato says about the move in today's press conference, as although he will be looking to endear himself to the Torino fans, he will also be aware that he will almost certainly be back at Juventus in the summer. Torino could only manage a goalless draw against Varese in difficult conditions at the Stadio Franco Ossola, a result that moved Toro down to third place in the table. Francesco Benussi made his first appearance for the away side, whilst fellow January signing Riccardo Meggiorini made his first start, as once again Rolando Bianchi started on the bench. Torino made a bright start and should of had a penalty in the opening stages when Meggiorini was upended by home goalkeeper Walter Bressan in the area. However, referee Angelo Cervellera waved away the appeals and Toro's long wait for a penalty kick continues. In form striker Mirco Antenucci came close to scoring for the third successive game, but after jinking past two defenders, his shot went narrowly wide of the post. Toro's best chance of the first half occurred when Juan Surraco found himself in space on the right wing and dribbled into the area before cutting the ball back to Meggiorini who blazed over the bar. In fairness to the new signing, the ball did seem to bobble on the poor pitch before it reached the striker, but he still should have hit the target. The home side had to wait until the second half for their first real chance of the match, as substitute Gianpietro Zecchin's dipping volley only just went over the bar from 30 yards. Toro coach Giampiero Ventura was dismissed from the touchline after complaining about a foul on Meggiorini, who was subbed for captain Rolando Bianchi with twenty minutes remaining. Varese nearly caught Torino on the counter attack after Guiseppe Vives gave the ball away, but debutant Francesco Benussi showed good positioning to rush out of his goal and clear the danger. By the end of the game, the weather conditions had got much worse, as it became difficult to even see the ball, let alone create any chances and the game ended goalless. After drawing their last two games away from home on difficult surfaces, Toro will be relieved to return to the Olimpico on Tuesday night against Vicenza, knowing that a victory is essential in order to keep up Sassuolo and Pescara at the top of the table. Torino will look to regain their place at the top of the Serie B standings when they play Varese on Saturday afternoon. Toro will look to fare better than they did last season, as they return to the scene of one of their most embarrassing defeats of the 2010/11 campaign - a 3-0 defeat last January. New signing Francesco Benussi should make his debut for Torino in goal, whilst Rolando Bianchi and Riccardo Meggiorini will be looking to replace Alessandro Sgrigna in attack, as he misses out with the flu. Former Varese striker Giulio Ebagua, who has been linked with a move away from the club, is in included in the squad after missing the last two games. Varese had a poor start to the season that ultimately cost Benito Carbone his job, but new coach Rolando Maran has succeeded in changing their fortunes around, and they currently occupy the last playoff position. Last season, much of Varese's success was built on their fantastic home form (they were unbeaten at home) but this season, they have already lost four times at the Stadio Franco Ossola. Torino have acted to quickly to replace injured goalkeeper Ferdinando Coppola by signing Francesco Benussi on loan from Palermo. Coppola was stretchered off in the 68th minute of Saturday's match against Cittadella after a collision with defender Valerio Di Cesare and Cittadella striker Robert Maah. It has since been revealed that Coppola has torn the cruciate ligament in his left knee and will be out for the rest of the season. Therefore, after assessing the potential candidates, Torino have decided to sign former Lecce goalkeeper Francesco Benussi on loan from Palermo until the end of the season. Benussi has made seven appearances for the Rosanero this season, but recently lost his place to Emiliano Viviano after he joined the club from Inter. Coppola has enjoyed mixed fortunes since joining Torino in the summer, as although he has been guilty of making a number of mistakes (especially against Gubbio) the experienced goalkeeper only conceded 13 goals in 22 appearances. Lets hope that Ferdinando makes a speedy recovery, and that Francesco can be an adequate replacement in Torino's quest for promotion. Torino failed to win away from home once again as they could only manage a draw against Cittadella on Saturday afternoon. New signing Riccardo Meggiorini started the game on the bench alongside captain Rolando Bianchi, as the in-form Mirco Antenucci and Alessandro Sgrigna started up front. It was the home side who had a dream start after just five minutes as poor Torino defending from a corner enabled Daniele Gasparetto to stab home. However, just ten minutes later the Granata equalised with their first chance of the game. The goal came after great link up play by Alessandro Sgrigna who played in strike partner Mirco Antenucci, who finished calmly into the bottom corner. Toro nearly took the lead after fantastic wing play by Alen Stevanovic, who first made Luca Martinelli fall on his backside, before delivering a cross that was well intercepted by home captain Francesco Scardina. Torino had the better of the second half, and Alessandro Sgrigna and Juan Surraco both should have done better when well placed in the final third. With twenty minutes left, Toro were forced to change their goalkeeper as Ferdinando Coppola was stretchered off after a collision with home striker Robert Maah. Riccardo Meggiorini came off the bench to make his debut, and the striker came so close to becoming an instant hero, but his left footed "toe-poke" went narrowly wide. Toro then had a fantastic chance to score the winner when Manuel Iori's fantastic pass found the in-form Mirco Antenucci, (who had scored Torino's last three goals) but his side footed shot was saved by the legs of Alex Cordaz from just seven yards out. In injury time, the Granata still managed to create one last chance, but substitute Rolando Bianchi was unable to connect with Antenucci's cross from the left. This draw, combined with victories for Sassuolo, Hellas Verona and Pescara means that the race for promotion is tighter than ever, and that Sassuolo have now overtaken Toro at the top of the Serie B table, albeit on goal difference. Torino will look to win their first away game since 1st November when they travel to Cittadella on Saturday afternoon. Toro started the season in record-breaking form away from home, as they won their first five games away from the Olimpico, but recently they have struggled on the road, and will be keen to rectify that problem as quickly as possible. New signing Riccardo Meggiorini should make his debut against his former team, whilst Manuel Iori, who made over 100 appearances for Cittadella is also available for selection after suspension. Rolando Bianchi should start despite injuring his hand in the week, and should have regained some confidence after scoring a hat-trick against Rivoli in a friendly on Wednesday. Toro's opponents Cittadella have had an average season so far and are currently in 11th position, but only three points outside the playoff positions. Cittadella's home form is particularly impressive, as they have won six of their eleven games at home, including the last two. Striker Robert Maah, who was particularly impressive in the reverse fixture at the Olimpico in August is their top scorer this season with seven goals. Torino have made their first acquisition of the January transfer window by completing the signing of Genoa striker Riccardo Meggiorini. Meggiorini has signed on a co-ownership deal, and could make his debut for Torino against his former side Cittadella on Saturday. One worrying statistic for Toro fans is the fact that in the last three years, Meggiorini has only scored seven goals in 73 appearances for three different clubs. That being said, Meggiorini did score earlier this season against Inter whilst on loan at Novara, and the last time the striker played in Serie B, in the 2008-09 season, he scored an impressive eighteen goals for Cittadella. Meggiorini's arrival is a timely one, as Captain Rolando Bianchi injured his hand in training on Monday, and is rated doubtful for Saturday's match. Here is a clip of Riccardo Meggiorini in action for Giampiero Ventura's Bari side in the 2009-10 season, including a goal against Juventus.